Are your old newspapers stacking up in the garage? You can drop them off at any of the school listed below. 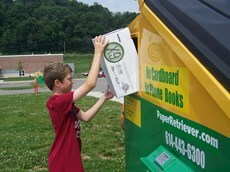 The schools have newspaper recycling bins located in the parking lot. In addition to newspapers, you can bring your magazines and catalogs, too. Did you know every ton of newspaper that is recycled saves the equivalent of 12 trees.So bring your newspapers to our recycling bins, you'll help our schools and the environment at the same time.